Medium-sized induction-hardening company relies exclusively on software CNC for new machines and retrofits. Stemmermann GmbH in Radevormwald, Germany specializes in the fields of induction heating and building inductors. Well-known companies from the automotive, aerospace, tool and mechanical engineering industries rely on the company’s know-how. The open software CNC from MDSI plays a major role in the reliable delivery and quality of the mainly mass-produced parts. In recent years, Stemmermann GmbH has used the enormous flexibility offered by OpenCNC for the customized construction of several new machines, and retrofitting the existing machines with the software CNC is also planned. Finally, OpenCNC will control the complete networked machinery, thus ensuring better planning stability. With its specialist knowledge in the field of induction heating, Stemmermann GmbH contributes to the general feeling of safety. The parts, which are mass-hardened, must resist extreme stress, for example during rudder setting in an Airbus airplane or in shock absorber piston rods. In addition, 18 employees produce several million parts per year in two shifts. Since the start of production in 1974, the company, now managed by the second generation of the family, has acquired extensive know how in processing sintered steel. Everyday production is characterized by short-term, high volume orders which are often collected on the same day. This requires considerable flexibility in production planning as well as in use of the individual machines. In the year 2000, a full order book made the company think about expanding their manufacturing capacity, but a borrowed test machine with controls from a well-known manufacturer could not convince the team responsible at Stemmermann. "Our staff found the controls particularly inconvenient to use", remembers managing director Dirk Stemmermann. "The controls were also inflexible, awkward to program and the operation was not clear for the workers." "Due to its flexibility, OpenCNC allows the customizated building of machines." Thanks to retrofits with OpenCNC, even several older machines reach a high level of productivity. The open software CNC from MDSI seemed to be a suitable solution. OpenCNC offered not only the required flexibility with respect to building new machines but also the chance of increasing the performance of some older machines by up to 20 percent with retrofits. The concept of an open-architecture software CNC allowed the affordable building and customizing of new machines to the exact production needs of Stemmermann GmbH. The use of standard PCs and other standardized hardware components means that the company is largely independent of any one controls supplier, especially in the long run. "Previously, the mechanical life of our machines mostly outlived that of the controls", explains Dirk Stemmermann. "So any repairs or spare parts required for the controls soon incurred considerable costs." Here the managing director saw one of the strengths of OpenCNC, as standard components can be replaced relatively easily in the event of repairs or if more powerful new hardware becomes available. And the software itself can also increase machine productivity as new versions can be installed at regular intervals. In the medium term, OpenCNC offers Stemmermann GmbH the option of using the same control on all machines. The targeted networking of the machines, a central requirement for connection to order processing, could be implemented using standard PCs under Windows, resulting in more transparent and flexible capacity planning. Another argument for OpenCNC was the fact that the Windows-based user interface can easily be customized to the users’ needs. Relevant input and display fields are centrally and clearly presented. The system even ensures easy integration of additional masks, e.g. for displaying the values of a water-temperature sensor. 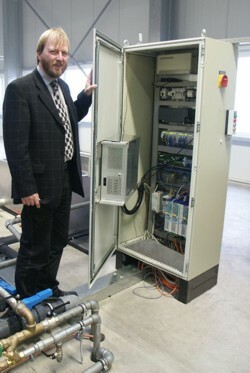 Christian Schlomann, an MDSI integrator based in Düsseldorf, Germany, was responsible for the design and construction of the controls, including electrical planning for the new machines. Performance requirements included short generator heating times of up to 0.2 seconds with a resolution of 0.5 milliseconds. 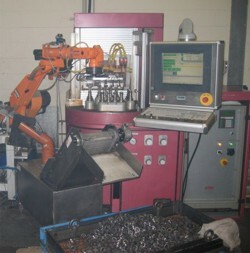 The machine with four interpolated axes should be flexibly usable for a wide range of parts. Another requirement was an angular resolution of 0.00025 degrees at a speed of up to 600 revolutions per minute. 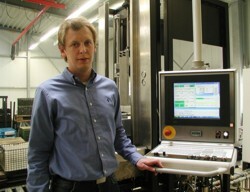 "For Stemmermann, we decided to use PROFIBUS together with Wago bus clamps, so that we could utilize the soft PLC integrated in OpenCNC to achieve the highest possible flexibility, standardization and openness for future extensions", explains Christian Schlomann, managing director of the engineering firm Schlomann. "All digital and analog inputs and even the temperature sensor and the power feedback from the generator run via PROFIBUS." Another indication of the flexibility of OpenCNC is the fact that the automatic feeders are partly also controlled by the CNC software. For quality assurance, all relevant process data is logged and saved on an SQL server. Because OpenCNC is integrated in the corporate network, machine logs with diagnostics data can be viewed on any office PC. A positioning repeat accuracy of 0.01 millimeters with coupling distances of 0.2 millimeters and hardening times with a resolution of 0.5 milliseconds ensure high process precision. The development and construction of the first machine took three months. "The delivery period for a ready-made machine would have been six to eight months, plus the time required for the necessary customizations here at the company”, says Dirk Stemmermann. "The bids that came in were considerably more expensive and the machines wouldn’t have been as universal for use with our wide range of parts. With OpenCNC, on the other hand, we have machines which are tailored exactly to our needs." The good experiences Stemmermann GmbH has had with OpenCNC have prompted the company to use the software CNC on a new kind of machine with a dual-frequency generator. With 100 kilowatts of power at a frequency of 200 to 250 kilohertz and 200 kilowatts at 20 kilohertz, it enables contour-accurate hardening, for example of gear-wheels, while shortening the heating process from 2.8 to between 0.2 and 0.5 seconds. "With this new machine generation, we are entering new territory together", says Christian Schlomann. "But we are convinced that the flexibility of OpenCNC will 125 ill also be helpful here and that we will be able to realize this ambitious project." As the possibilities of reducing auxiliary process times have been exhausted, the dramatic shortening of the heating process means an enormous increase in productivity. "The new machines running OpenCNC are tailored exactly to the needs of Stemmermann GmbH." Through the use of OpenCNC from MDSI on all machines, Stemmermann GmbH has not only increased its planning stability. The wide range of parts which can be produced on each machine with OpenCNC, in combination with the connection of the software CNC to capacity planning, has greatly improved the flexibility in production planning as well as the company’s delivery reliability. The desired further growth of the company has become more calculable as the cost and performance of additional machines are known. Any employee can work on any machine, and this is also true for new employees as the user-friendly controls require minimal training. "Even repairs and the associated downtimes are less frightening with OpenCNC”, says Dirk Stemmermann. "The software itself cannot break and we can replace most of the standard hardware components ourselves."